ON THIS DATE (October 8, 1933) ... Playing truly sensational football at times, the Boston Redskins opened their first ever home stand at Fenway Park, turning back the New York Giants by a score of 21-20. Great runs and spot passing, accompanied by great blocking were all there, with the Redskins delighting the 15,000 fans. The Giants' Harry Newman contributed runs of 50 and 80 yards but it wasn't enough. Six touchdowns were made by six different players. 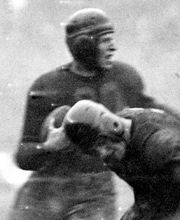 The difference was Redskins' tackle Turk Edwards who stuffed the Giants' attack to keep the score on the Redskins' side. Cliff Battles and Jim Musick picked up right were they left off last year and promised that they will be in the fray for every minute this year. Cliff Battles rushed for 215 yards, thus becoming the first NFL player to exceed 200 yards rushing in a game. The Redskins appear to be a well defined hard working eleven. The Redskins converted the first time they had the ball, capitalizing on a Giants' fumble. From there on it was an exciting back and forth battle, as the Redskins stopped the Giants almost everywhere when they had to. Turk Edwards block of a Giants extra point put the Giants in a position to need two touchdowns to win. The Giants came back in the fourth quarter on an 80 yard pass to Harry Newman to put them within a touchdown, but two missed Giant field goals sealed the Redskins win.